MT. HOOD, OR (Immediate Release) – Cooper Spur Ski Area will open for the season Wednesday, December 26, just in time for the holiday week. 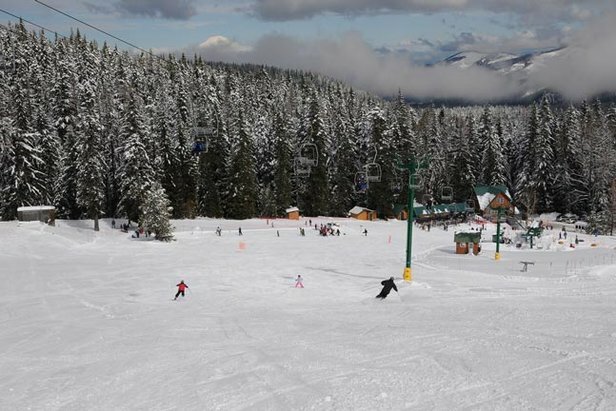 Cooper Spur offers affordable skiing, snowboarding and tubing. The ski area is located on the north side of Mt. Hood, just 23 miles south of Hood River and is owned and operated by Mt. Hood Meadows. The resort will open with a 10 inch settled base, having received more than a foot from this week’s storm. The ski area is scheduled to operate the Homestead chairlift, plus a beginner rope tow daily from 9 AM - 5 PM through January 1 and then return to it normal operating schedule (Fridays 4 - 8 PM, Saturdays and Sundays 9 AM - 5 PM.) Tubing will be added with more snow fall. Cooper Spur also offers 6.5 kilometers of trails for skating, traditional striding and snowshoeing, with the trails conveniently located adjacent to Cooper Spur lodge and cabins. Families can rent equipment and access the trails right from their cabin, condo or lodge room. Cooper Spur has long been a family favorite offering affordable lift ticket and rental packages. Lift tickets are just $39 for adults, $32 for juniors 7 – 14 or seniors 65+ and $10 for kids 6 and under. The ski area offers ski and board rentals for just $29 for all ages. In addition to its lifts and tubing; Cooper Spur offers ski and snowboard lessons and has a learn to ski or snowboard packages. The learn to ski/snowboard packages includes a lift ticket, 1 hour lesson and equipment rentals. The ski area also has a lodge, food service operation and an outdoor covered deck. Season Lift and Tubing passes are on sale for just $214 for an individual, $439 for a family of four (spouse and dependents age 22 and under), making an entire season of riding at Cooper Spur incredibly affordable. For more information call the Cooper Spur snow phone at 541.352.7803 or visit the web site www.cooperspur.com. Cooper Spur Mountain Resort is a mountain lodge, wedding and meeting center on the north side of Mt. Hood, featuring log cabins, lodge condo suites, hotel rooms, a log home, restaurant and lounge, Alpine ski area, Nordic Center with cross country trails, tennis court, spa facility with a deck and three hot tubs. Cooper Spur Mountain Resort facilitates weddings business meetings, team building sessions and recreational pursuits, as well as family vacations. It is located on 775 acres of private forest land, a 1400 acre US Forest Service ski area permit, all surrounded by Mt. Hood National Forest.